Dr. Stefanie Shattuck-Hufnagel is a principal investigator in the Research Laboratory of Electronics (RLE) at the Massachusetts Institute of Technology (MIT). She received her B.A. from Wellesley College in 1965 and her Ph.D. in psychology from MIT in 1975. 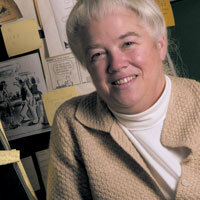 She was Assistant Professor of Psychology at Cornell University from 1974 to 1979 before joining RLE in 1980. Dr. Shattuck-Hufnagel investigates the cognitive structures and processes involved in speech production planning, particularly at the level of speech sound sequencing. Her work with speech error patterns and with the acoustic analyses of prosody has implications for cognitive models of speech production and for phonological theory, as well as applications in speech recognition and synthesis. Song, J. Y., Demuth, K., & Shattuck-Hufnagel, S. (2012). The development of acoustic cues to coda contrasts in young children learning American English. Journal of the Acoustical Society of America, 131(4), 3036-3050. Song, J. Y., Demuth, K., Shattuck-Hufnagel, S. and Menard, L. (2013), The effects of coarticulation and morphological complexity on the production of English coda clusters: Acoustic and articulatory evidence from 2-year-olds and adults using ultrasound. Journal of Phonetics 41(3-4), 281-295. Song, J. Y., Demuth, K., Evans, K., & Shattuck-Hufnagel, S. (2013), Durational cues to fricative codas in 2-year-olds' American English: Voicing and morphemic factors. Journal of the Acoustical Society of America 133(5), 2931-2946. Cole, J.S. and Shattuck-Hufnagel, S. (to appear), Exploring speaker-specific phonetic reduction in imitated speech. In Clayards, M. (ed. ), Reduction Revisited. Barnes, J., Brugos, A., Veilleux, N. & Shattuck-Hufnagel, S. (2011), Voiceless intervals and perceptual completion in F0 contours: Evidence from scaling perception in American English. In Proceedings of the 17th International Congress of Phonetic Sciences, August 2011, Hong Kong. Katsika, A., Shattuck-Hufnagel, S., Mooshammer, C., Tiede, M. & Goldstein, L. (2011), Effects of prosodic grouping and phonemic content on error patterns in the production of repeated strings. Poster presentation at the International Seminar on Speech Production 2011, Montreal, Canada, 20-23 June 2011. Tiede, M., Goldstein, L., Mooshammer, C., Nam, H., Saltzman, E. and Shattuck- Hufnagel, S. (2011), Head movement is correlated with increased difficulty in an accelerating speech production task. Presented at the 9th International Seminar on Speech Production, Montreal. Brugos, A. and Shattuck-Hufnagel, S. (2012), A proposal for labelling prosodic disfluencies in ToBI. Poster presented at the workshop on Advancing Prosodic Transcription for Spoken Language Science and Technology, July 31, 2012, Stuttgart, Germany. Mixdorff, H., Cole, J., Shattuck-Hufnagel, S. (2012), Prosodic similarity--evidence from an imitation study. Presented at Speech Prosody 2012, Shanghai. Zipse, L., Shattuck-Hufnagel, S., & Worek, A. (2012). Can people with aphasia reproduce and discriminate rhythms? Poster presented at the ASHA Convention, Atlanta, GA.
Barnes, J., Brugos, A., Rosenstein, E., Shattuck-Hufnagel, S. & Veilleux, N. (2013), Segmental sources of variation in the timing of American English pitch accents. Paper presented at the Linguistic Society of America, Boston, January 2013. Zipse, L., & Shattuck-Hufnagel, S. (2013). Vowel Duration and F0 Stability in Singing vs. Speech. Poster presented at the Society for Music and Perception Conference, Toronto, Canada. Barnes, J., Brugos, A., Veilleux, N. & Shattuck Hufnagel, S. (2014), Segmental Influences on the Perception of Pitch Accent Scaling in English. In Campbell, N., Gibbon, D. and Hirst, D. (eds. ), Proceedings of Speech Prosody 7, 1125-1129. Murton, O., Zipse, L., & Shattuck-Hufnagel, S. (2014). Do Repetitions of Short Patterns Show Systematic Beat-related Inter-pattern Intervals? Platform presentation at the annual New England Sequencing and Timing (NEST) meeting, Amherst, MA.